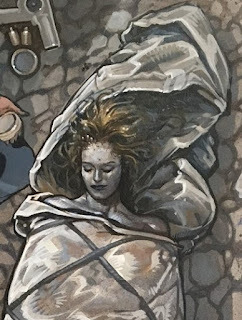 Wrapped In Plastic #17 stands out to me as a particularly fine issue for a number of reasons: First, it contained a wonderful essay by Rhonda Wilcox about vampirism in Twin Peaks. Second, it included a lengthy letter from Tim Lucas of Video Watchdog fame. Third, it featured a long interview with Harley Peyton about Twin Peaks and other Peyton projects. Peyton: All the actors [on Twin Peaks] were great; we had no problems with them. The running of it was pretty simple. Stoltz: Well, then, how come Kyle refused to cooperate? Peyton: A very good question. Thorne: We had heard that he didn't feel his character should be involved with someone who was supposedly under-age. Spader: Just leave me out of it! Stoltz: [To Spader] Don't talk to Harley! Peyton: All these guys were great because they loved it. It really was a fun job. You'd go to this place every day and you'd do the work and everyone got along pretty well. So that part of it was wonderful. Craig Miller (center) animatedly discusses Twin Peaks with Harley Peyton (right). I recommend tracking down WIP 17 for the full interview. It’s something else. But, wait, I’m getting sidetracked. . . .
What also excited me about WIP 17 was the cover. 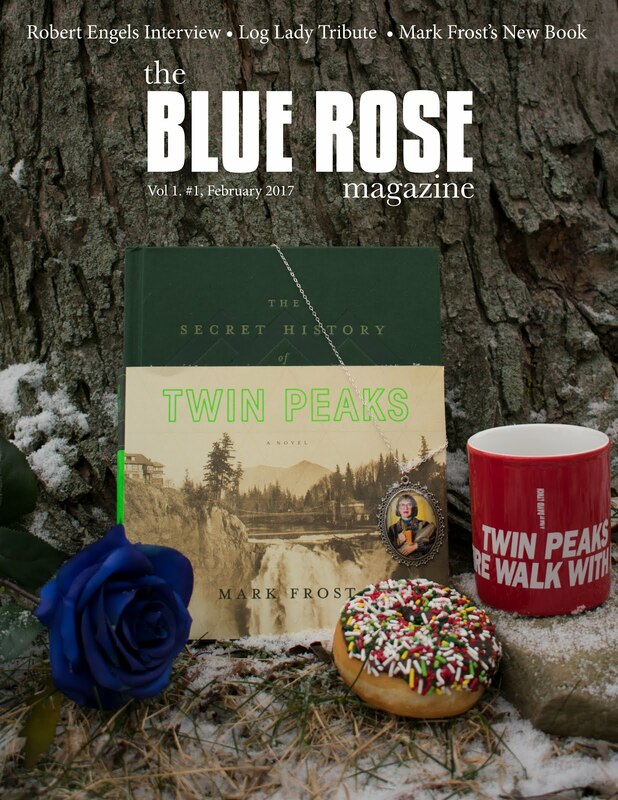 Because we were printing our first in-depth interview with one of the producers of Twin Peaks, we wanted to convey a “behind-the-scenes” concept for the cover. We did not have any good photographs to use, so we decided to go with an illustration. Craig Miller had been in touch with Chris Moeller, an accomplished artist who, at that time, was working on the Shadows Empire comic book for Dark Horse Comics. 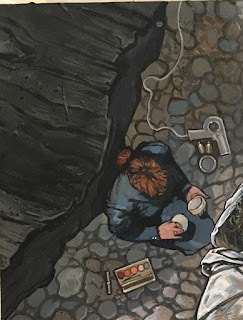 Craig commissioned Chris to do the cover for WIP 17 with a “behind-the-scenes” theme. 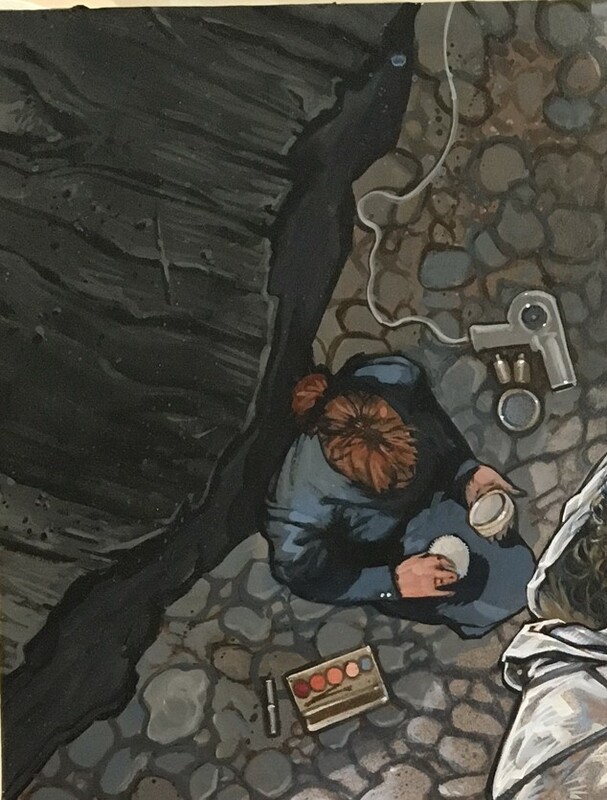 Chris produced a beautiful acrylic painting that depicts a possible scenario from the making of the Twin Peaks pilot: a make-up artist tends to Sheryl Lee as she waits, wrapped in plastic, for the shoot to begin. I love the detail in the painting. 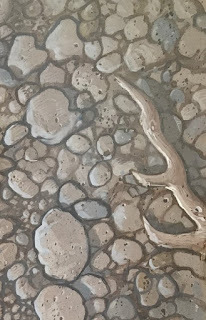 the smooth stones and driftwood are an embellishment, yet these elements delicately balance the composition. It’s a beautiful work of art! 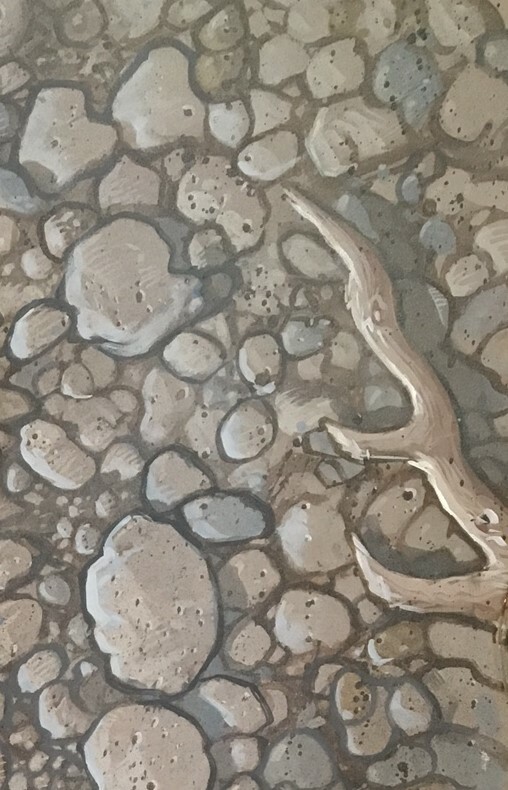 For some reason, the painting took on a brown tone when the cover was printed. 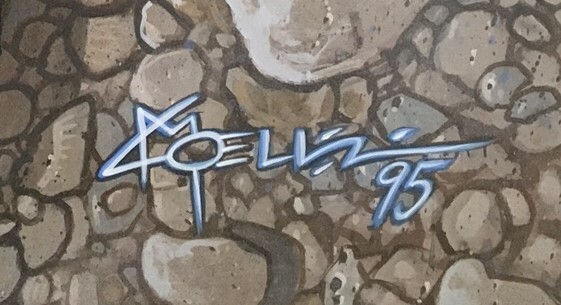 I’m not sure why, as the original was bluer and definitely had a “cooler” look to it. For years, Craig had Chris Moeller’s original painting prominently displayed in his office. After Craig passed away, Howard Miller (Craig’s father) generously offered the painting to me. I was thrilled and honored to get it; the original cover to issue 17 is one of the great treasures from my years working on Wrapped In Plastic. 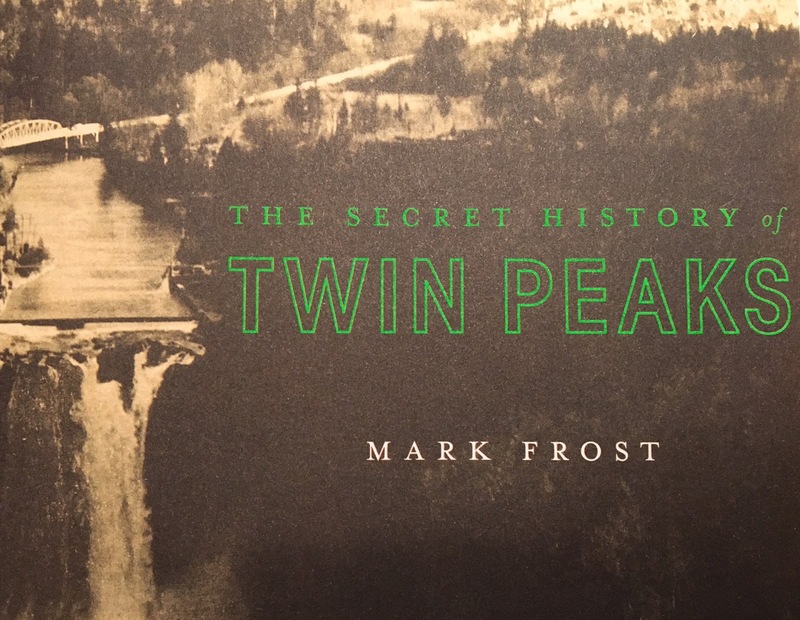 As everyone knows, Mark Frost's The Secret History of Twin Peaks is out and it is getting some strong reaction from fans. 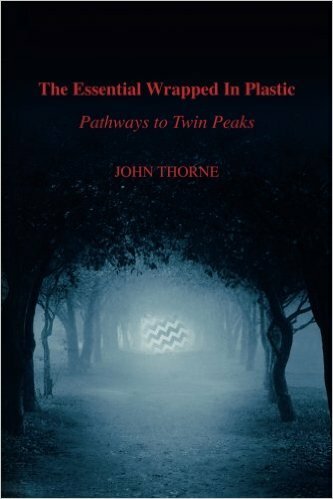 Almost everyone is happy to have it in their hands, to be reading it at long last, and to be returning to the world of Twin Peaks that Frost and Lynch created back in 1989-1990. But with happiness has come distress. Some are many who are quite alarmed by the book. And here is where I get into spoilers. I'm about to discuss a big, over-arching structural spoiler (not detailed spoilers). If you haven't read the book (or all of the book) you may want to stop reading NOW. The "history' recounted in the book is not the history most fans know. A great many details are just plain wrong. How can this be? Some suggest that Mark Frost simply didn't do enough homework about Twin Peaks and messed things up. Others think he may have purposefully discarded established backstory in favor of new details which he preferred. But neither of those seems plausible once you hear what Frost has said in various interviews, and once you see what kind of effort he put into the look, structure, and writing of the book. Mark Frost knows what's what. On Twitter, Frost has declared that "all will be revealed in time." So, clearly there is a bigger scheme at work here: a more intricate plan is in place. Many are suggesting the new history is the result of time-travel or alternate timelines. Well, I think they are onto something. 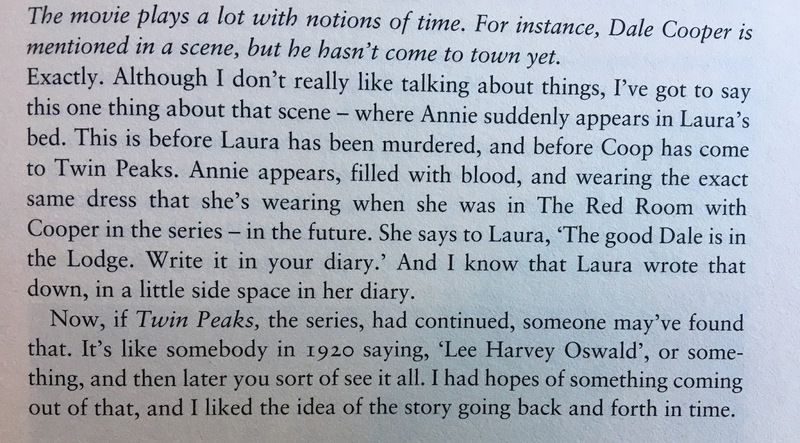 When David Lynch was making Fire Walk With Me, he purposely introduced a time-travel element. When Annie Blackburne appears to Laura, she is the Annie from the future attempting to alter the past! 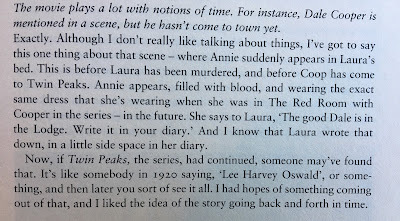 Lynch on Lynch, p 187. Look at that last paragraph! Lynch says he had hopes that someone would see Annie's message and "sort of see it all." See what? See the future! 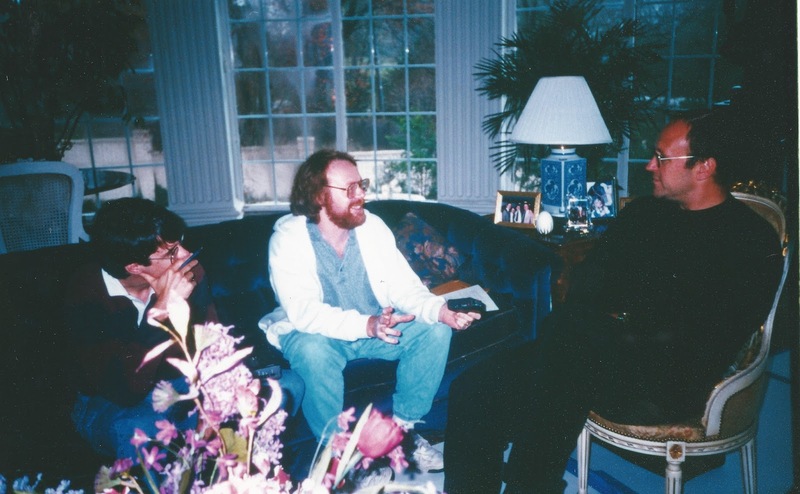 And then he says, "I had hopes of something coming out of that, and I like the idea of the story going back and forth in time." There it is. 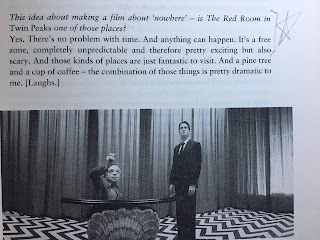 I believe Lynch's interest in the story going back and forth in time stayed with him--that he and Frost discussed the idea--and implications--of time travel and then introduced those ideas into the new series. This helps explain the altered nature of the new Twin Peaks history. Lynch on Lynch p 19. 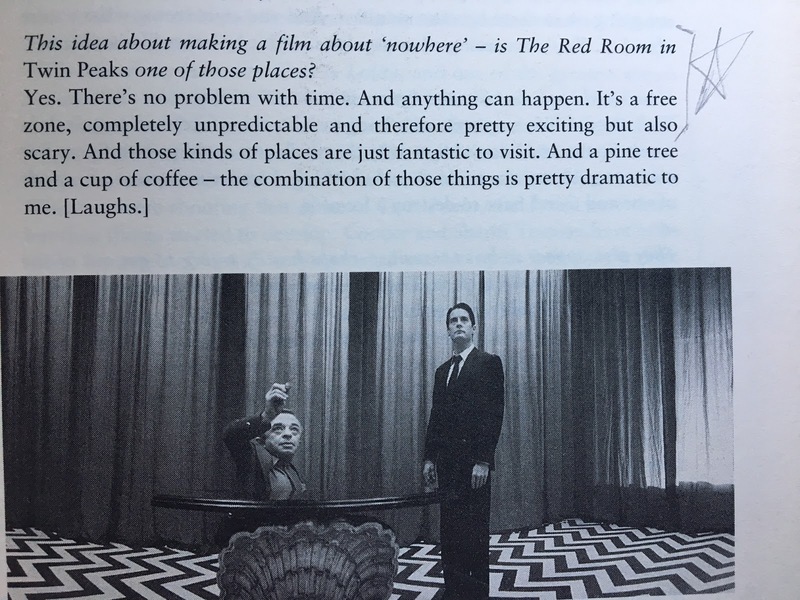 Lynch says there's no problem with time (which I interpret to mean time travel is possible). Did Annie go back in time and change the course of events? Did she end up never visiting Twin Peaks? Could the Good Cooper also go back in time--maybe further back in time--and change even more events? I'll try to provide a more detailed review of Frost's new book in the next few weeks or months. I'm still digesting it. There is much to study . . . . . . . 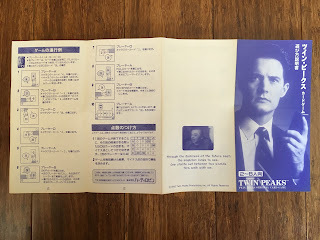 Many Twin Peaks fans might be familiar with the two Twin Peaks board games that were produced in the years following the series: The Twin Peaks Murder Mystery Game from the UK, and the Game of Twin Peaks from Japan. 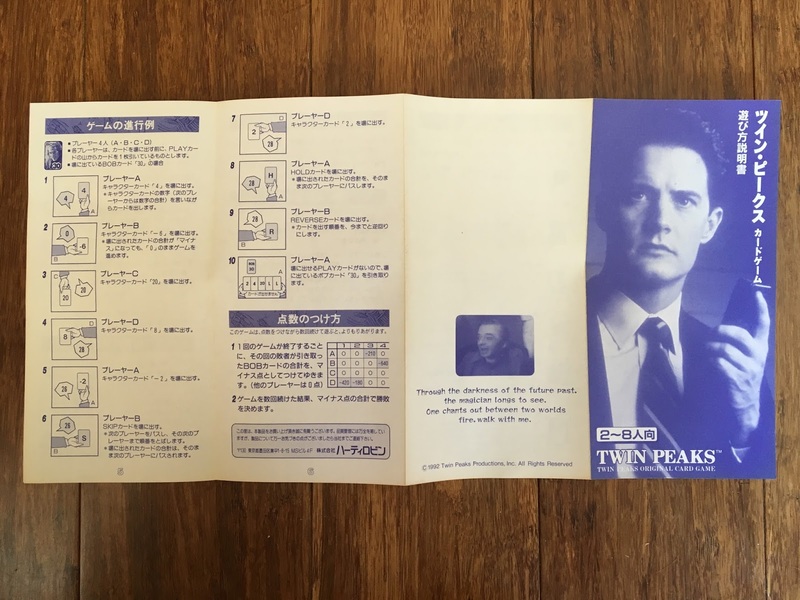 But there is a third game: The Twin Peaks Original Card Game, manufactured by WIZ CO., Ltd., in Japan in 1992. The card set comes with a small illustrated instruction pamphlet that provides detailed rules of play. There also appears to be a summary card that provides a quick overview of the game on one side and what is probably a character-relationship chart on the other. 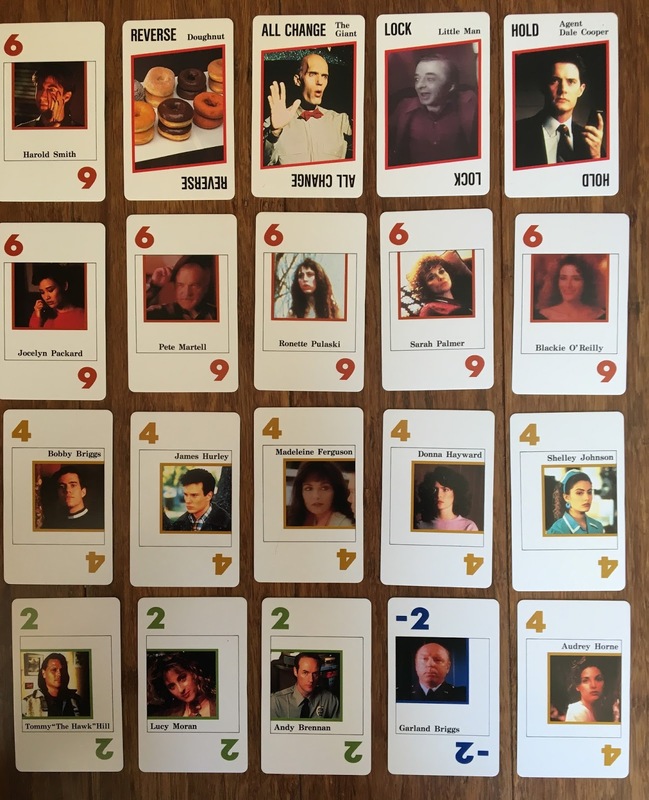 The Twin Peaks Original Card Game is a handsomely produced game. The 60 cards comprising the game are all printed in full color and measure 2" by 3". The summary card measures 3.25” by 6.25”. The cards and instructions are packaged in a black plastic videocassette case where all pieces are housed in a plastic insert tray. After we featured this game in Wrapped in Plastic 66 (August, 2003), readers, Noriko Hara and Phil Eskew, translated the instructions for us. We featured the full translation in WIP 67(October, 2003). What follows is a portion of that translation. 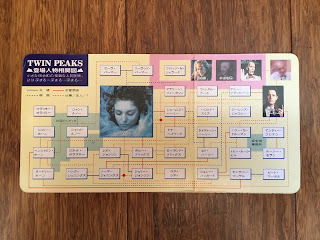 Do you know Twin Peaks? Twin Peaks is a small, rural town located in the Northwest of the United States near the Canadian border. 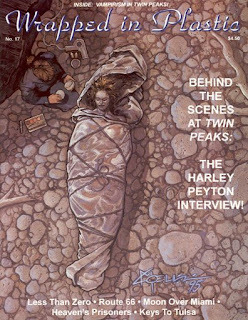 On the morning of February 24, 1990, Laura Palmer’s dead body was found on the riverbank wrapped in plastic. FBI Special Agent Dale Cooper has been assigned to solve the murder. The deeper he digs, the weirder things become. Twin Peaks, a unique suspense-drama, is the product of the creative genius of David Lynch. 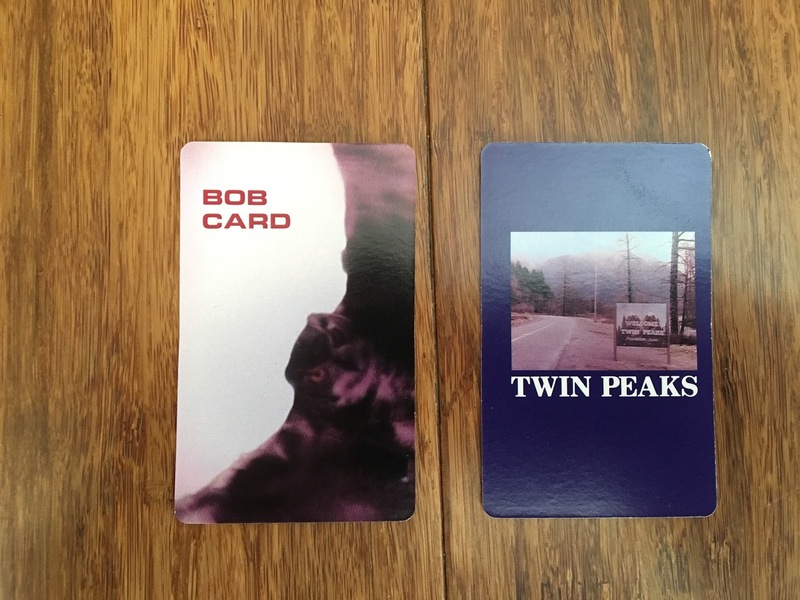 Now Twin Peaks is a card game! 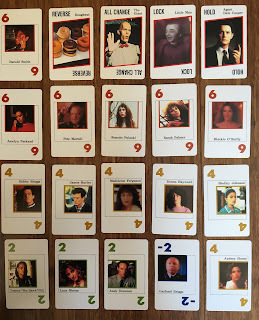 The Twin Peaks card game is a game in which players attempt to avoid becoming possessed by Bob who appears in Twin Peaks. 1) Each player has four “Play” cards and the rest of the “Play” cards and “Bob” cards are stacked separately. A player picks one of the “Bob” cards and turns it over so the number is showing. 2) Then each player goes through steps A and B in order. B) The player picks one of his  cards and places it on the table so the others can see it. Each player does so in order. The players add the numbers on the cards as they go around the table. 3) The goal is to avoid being the player whose card causes the total number to exceed the number on the “Bob” card. The person whose card causes the number to exceed the number on the “Bob” card, takes the “Bob” card. Repeat 1) – 3) and at the end of the game the player with the least amount of “Bob” card points wins.